Volunteers are an integral part of providing high quality of life to the residents of Streamway Villa, so the Cobourg long-term care home hosted its annual volunteer appreciation barbecue on Sept. 23 to thank the people who generously give their time to help residents. Streamway Villa life enrichment co-ordinator Christina Doughty says the barbecue “was a huge success,” adding about 15 volunteers attended. Streamway Villa, she adds, would not be the home it is without the help of its nearly 30 volunteers. “We are very fortunate to have such amazing volunteers that come to our home to strive to bring hope, love and understanding to all of our residents in the form of musical entertainment, crafts, walks, helping on special outings, church services, therapy pet visits, events or socializing one-to-one (time) with our amazing residents,” Christina tells The OMNIway. Christina used some creativity to come up with a gift idea for volunteers. 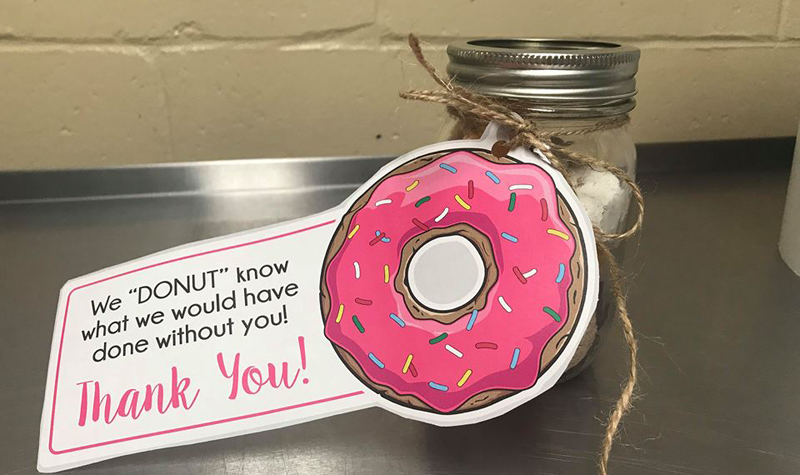 She filled Mason jars with mini doughnuts and tied string around the top with notes that read, “We DONUT know what we would have done without you!” Each volunteer received a jar of mini doughnuts. Christina says she got the idea from Pinterest. Most OMNI Health Care long-term care homes host their volunteer appreciation events in April during National Volunteer Week (April 15-21 this year). However, spring is already a busy time at Streamway Villa and Christina says the home likes to host its volunteer appreciation events just as soon as summer – the busiest time of the year for volunteers – is coming to a close.